Today I have a simple card for you that also easily fits in an envelope for mailing. The beautiful Tulip Time Collection is so versatile! Instructions: Card size is 6 x 6”. Cut one piece of shimmery white cardstock 6 x 7”, score and fold at 1”. Cut another piece 6 x 6”, adhere the two pieces together to create a top fold card base and round the corners. 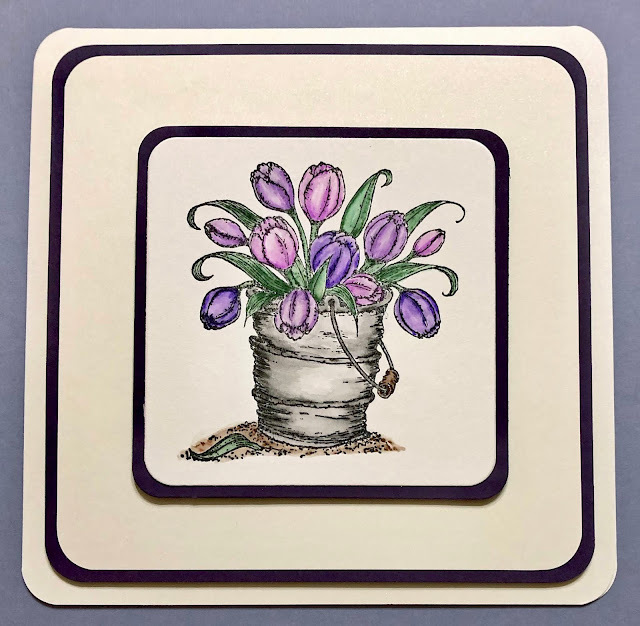 Cut an Elegant Eggplant mat layer 5 1/2 x 5 1/2” and a shimmery white mat layer 5 1/4 x 5 1/4”, round the corners and adhere together using dries clear adhesive. Adhere to card base using dimensional tape. Cut a piece of Elegant Eggplant cardstock 5 7/8 x 5 7/8” and adhere to inside of card using dries clear adhesive. Stamp Tulip Bouquet image on Strathmore Bristol cardstock using Archival Jet Black ink. Color the image using the Zig Clean Color Real Brush Markers and the In Color Water Brush. Use the Cut Mat Create 2B die to cut the image. Use the Cut Mat Create 2A die to cut an Elegant Eggplant mat layer. Adhere together using dries clear adhesive and adhere to card base using dimension tape. Please be sure to visit the Heartfelt Creations Blog to see all of the gorgeous projects created by the fabulous design team! Love your design and your coloring is perfect! This is striking! I love, love, love your coloring! Wow - what a beautiful design and I love your colouring with the Zig markers!